T he Hiram Bingham Train is one of the world’s most exclusive and expensive train rides on offer in Peru. The 3 hour train journey, operated by Orient Express, is the most luxurious way to travel from Cusco to the ancient Inca citadel of Machu Picchu. Paul Jones a Luxury Peru Travel expert takes a look at just why it’s so popular and what you get for your money. The train takes its name from the famous American explorer and Yale University lecturer – Hiram Bingham, who brought Machu Picchu to the world’s attention, when he stumbled across the citadel in 1911. It never ceases to surprise me just how popular the Hiram Bingham Train is, and just how many people have heard about it. 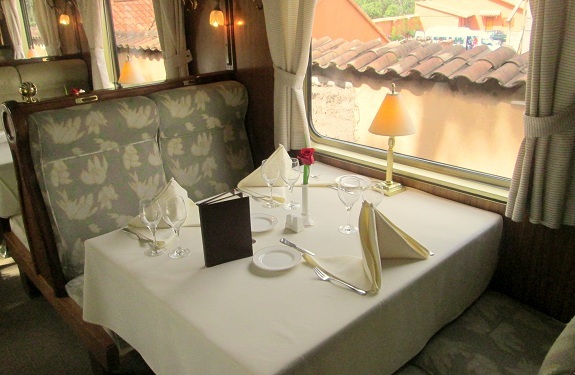 Frequently featured in many of our luxury Peru vacation packages, the Hiram Bingham Train is always in demand, and often sold out several months in advance. In 2013 a return ticket to Machu Picchu will set you back US$ 734 per person, about 4 times more than the regular first class Vistadome service. So what makes it so special? And really, is the Hiram Bingham Train worth the money? When a client asks me, is the Hiram Bingham Train worth the money? I find it a difficult question to answer. I guess the answer is ‘it must be’, because it if wasn’t then it wouldn’t be so popular, and people wouldn’t be prepared to pay the money. It certainly is one of the best luxury Peru travel experiences available, so let me tell you a little more about the Hiram Bingham Train and what a ride on-board includes. The Hiram Bingham Train is a luxury Peru travel experience, which starts from the moment you arrive at the train station until you get off the train near Machu Picchu, 3 hours and 19 minutes later. The train departs from Poroy station which is located on the outskirts of Cusco, a 35 minute journey by road. On arrival at the station you are welcomed with traditional Peruvian dancing and a choice drinks and Canapés. 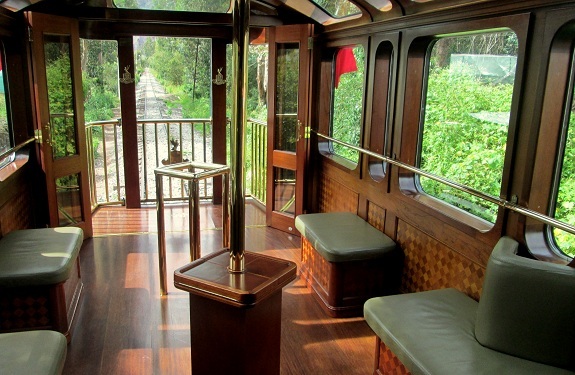 The deep blue-colored carriages of the Hiram Bingham train are decorated with distinctive gold writing, and are fitted in the style of the 1920s British Pullman Carriages. The train comprises of 5 carriages: 2 luxury dining cars, a bar car, an observation car and a kitchen car. On departure you are shown to your seating and table. The two dining cars have a capacity of 42 passengers each, and are opulently decorated with plush cream seating and tables adorned with sparkling tableware and glasses. The train slowly follows a route which takes it across open countryside and onto the Sacred Valley of the Incas. Joining the valley close to the ancient village of Ollantaytambo, the train stops to collect passengers boarding from hotels located in the valley. 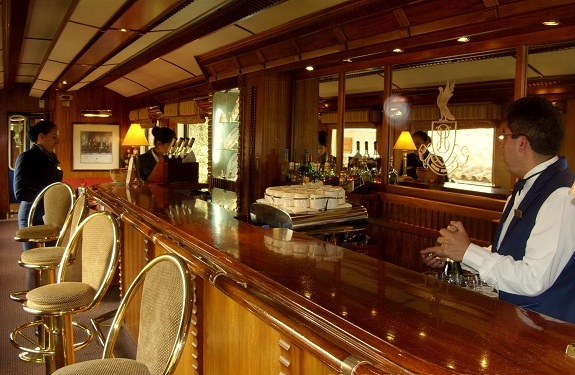 During this portion of the journey, guests are offered further refreshments, and the chance to explore the bar and observation cars. 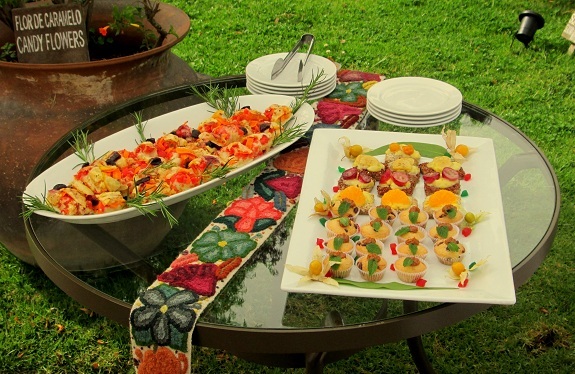 On the second stage of the journey (Ollantaytambo to Aguas Calientes – 2 hours) you are invited to enjoy a gourmet brunch. 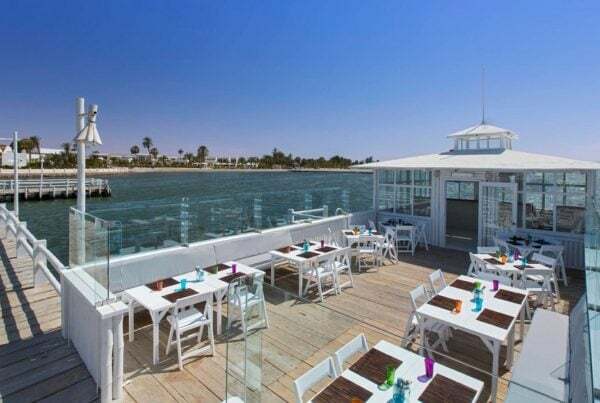 The 3-course brunch consists of a light entre, a main-course and a dessert, all of which is accompanied with a choice of complimentary sparkling Peruvian wines. After brunch, guests are welcomed into the bar car where the expert bar man teaches the secrets of making Peru’s national drink, the Pisco Sour. As passengers sit back to enjoy their Pisco they are further entertained by live Andean music, featuring traditional instruments such as the Andean flute and pipes. As you descend slowly towards Aguas Calientes following the fast flowing Urubamba River, the scenery becomes more dramatic as the valley narrows, and the towering mountain peaks dominate the skyline. The observatory car is the perfect place to see the impressive views, take a few vacation snaps and get to know the fellow passengers. On arrival in Aguas Calientes, passengers take a 30 minute private shuttle bus ride from Aguas Calientes to the citadel of Machu Picchu. After a guided tour of the citadel the Hiram Bingham Train guests are welcomed at the Sanctuary Lodge Hotel for afternoon tea and snacks. The Orient Express owned hotel is the only hotel located adjacent to Machu Picchu, and is an easy two-minute’ walk from the entrance. The return journey (not necessarily the same day) is a similar affair as the outward journey, but this time including a gourmet 4-course dinner. 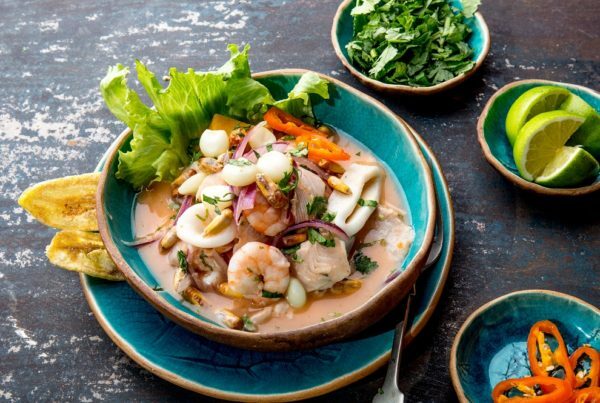 Designed by the on-board chef, the cuisine includes regional dishes, which utilize local ingredients and flavors accompanied by a selection of Peruvian wines. So back to my original question – is the Hiram Bingham train worth the money? Well, for value for money, it’s probably not, but for a luxury travel experience that you’re rarely going to find anywhere else, it probably is. I guess it really comes down to peoples individuals tastes. Personally, I don’t think I would pay the money, choosing to spend the cash on up-graded hotel rooms, or several nice meals throughout my vacation. However, if it was marking a special event like an anniversary or perhaps a honeymoon then maybe I would consider it. 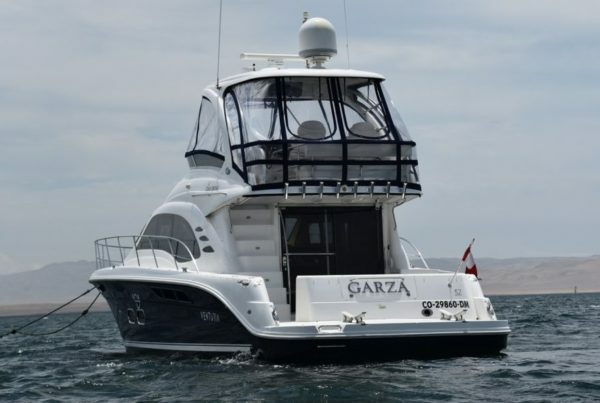 However you value the journey, it is certainly an exquisite luxury Peru travel addition, and should you take the plunge, it will certainly reward you with great memories for years to come. If you think that the Hiram Bingham Train is something that you would like to include on your trip to Peru contact a luxury Peru travel expert today.